9 Fakta Menarik BlackBerry OS 7 ~ " World Information "
As reported earlier, the BlackBerry 7 OS could not be used on BlackBerry devices older models. If you want to enjoy the ability of the OS, applicants have to pay for new models like the BlackBerry Bold Touch. 7 BlackBerry handsets can not be used in a long time because it needs extra power, such as 1.2 GHz processor in the Bold Touch. 1.2 GHz processor fairly big leap. Previously there has not been as strong as these processors on the BlackBerry. BlackBerry Browser on a BlackBerry capabilities plus 7. With Liquid features enhanced graphics, rendering will be faster. RIM claims the browser in the OS 7 1.6-fold faster than the OS 6. BlackBerry Browser 7 also has a full support for HTML 5 elements, such as video HTML 5 video tag use. BlackBerry Balance feature is designed to separate the personal content and content work on a BlackBerry device. 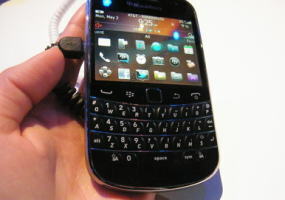 With BlackBerry OS 7 in 9930 and Bold 9900 handset, the user gets full versions Docs To Go with all premium features available. So the user can use Word, Excel, and PowerPoint directly from the device. With NFC, the user can make payments directly via the handset. This feature is a sort of digital wallet where users can simply hold the phone to a sensor (like the RFID card in the machine absent). BlackBerry 6 has introduced a feature called Universal Search to find content on the handset. BlackBerry 7 menyempurnakanya so that searches can also be done with sound. Redesigned BlackBerry icon in OS 7. Otherwise smooth interface when used.